Whip up artisanal cocktails for the after-work crowd, and you’ve got the makings of a cheerful happy hour. 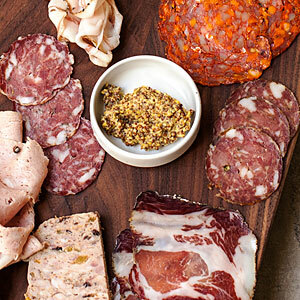 Add the city’s best charcuterie, and it becomes euphoric. Trou Normand, the South of Market hot spot from the Bar Agricole team, is open for breakfast and lunch too, but it really hits its stride as the day winds down. Think house-cured Tuscan salami with a Tequila Cocktail, or fennel-scented coppa with a Corpse Reviver #1, a beautiful libation that blends armagnac, calvados, and vermouth. The kitchen also deals in delicious entrées—grilled trout with salsa verde, braised pork meatballs in vibrant tomato sauces—so you’ve got cause to stick around as happy hour gives way to evening.